There are lots of room dividers on the market. Most of them are solid, stationary and more functional than aesthetically pleasing. In contrast to these room dividers, our room divider screen Facet lets light through, is customizable and an eye-catcher. These decorative room divider screens will immediately liven up your place and will make it look more sophisticated. Facet will not only fulfill your room dividing needs, it will also form a stunning addition to your interior decoration. It’s beautiful and unique design will complete your space. It does not matter if it is used in your home, restaurant or office, Facet fits in any type of room. Facet looks gorgeous and performs a function. It is a striking piece of design which also gives some privacy where needed or divides a room into separate spaces. Surprise your guests with these decorative room divider screens. Your guests will be in awe of your interior decorating skills when they see your decorative room divider screens. People will not be able to stop staring at its intricate pattern, while the light and airy quality of Facet will create just the right atmosphere. Our decorative room divider screens, consists of several separate diamond-shaped parts. The additional feature that makes it unique, is that every single facet can be rotated. This gives you the chance to see what works best in your space. You can turn a few facets around to a specific angle to let more light shine through. This will change the pattern and make your screen unique. This way you can play with the transparency of your room divider screen and adjust the amount of privacy it gives. It also means that you can change the pattern slightly to fit your mood or the specific space you are using it in. What’s more is that you can customize Facet in any way you like. We can make your decorative room divider screens in any size you may need it. You can also choose from the available colors so that it fits perfectly in your style. Attaching it is also very easy. Just follow the steps delivered together with your order and you will have your decorative room divider screens up in no time! Feel free to contact us if you have any questions or queries. 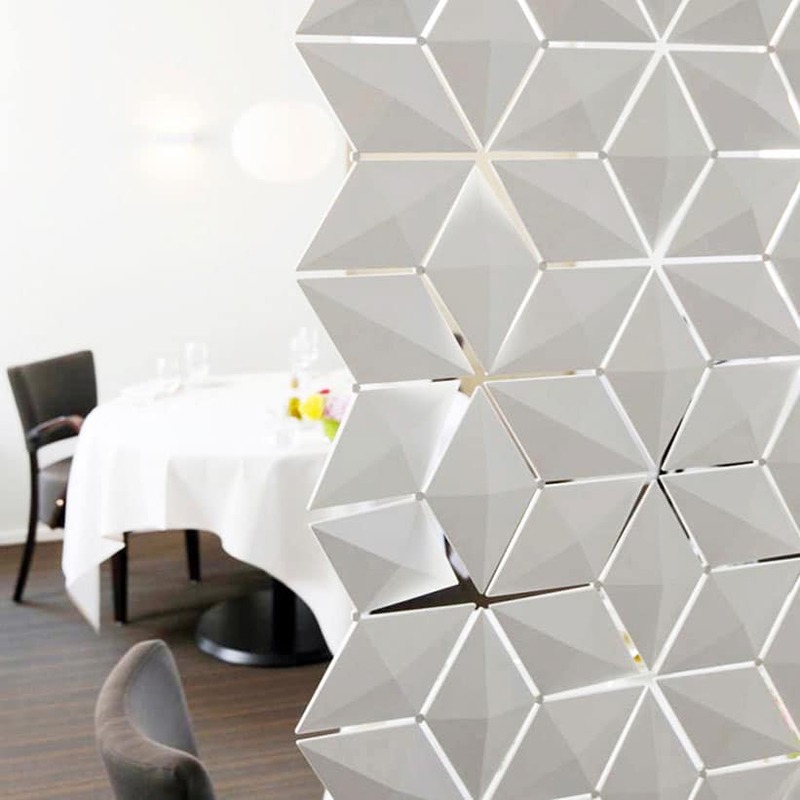 The decorative room divider screens featured in the photos are installed in a stylish restaurant in Sprang-Capelle, The Netherlands. It brings more life and movement into the décor while keeping it classy and sophisticated. It gives the guests a little more privacy and something beautiful to look at while dining. The perfect choice if you need something to divide up spaces and add a decorative element at the same time. I am delighted the room divider Facet! The room divider is a lightweight product, simple to install, modular and brings a real deco element to offices. It is fun to play around with the facets to obtain a surface which is more or less opaque. The room divider curtain is strong, solid and fixed tight on its mountings, and is really flexible. Highly recommended! The product is great and absolutely beautiful, great show stopper for the grand opening. Maybe too fragile for overcrowded areas. The Room Divider Facet offers an easy way to divide spaces. It comes together with these diamonds, which can rotate so you can have privacy and ventilation. Or: you can have it nice and closed off. Awesome! It is like Lego on steroids! A room divider that doesn't take too much room!